I pray you are geared up to enjoy a blessed day while celebrating the resurrection of Jesus! We must remember the reason for this season. 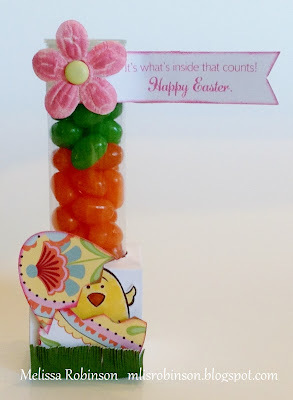 I had fun decorating our My Creations Clear Treat Tubes with the C-U-T-E (I use that word a lot in my posts, huh?) Easter Wishes stamp set. 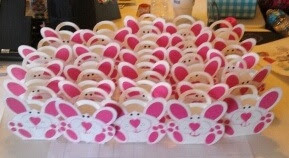 It is a good thing this stamp set is just for Easter or you might have seen it on quite a few of my creations throughout the year. It is stinkin' cute! I used just a couple of the images on this item but I LOVE all of them! The sentiments are just as adorable as the egg and chicks. I have enjoyed playing with theses tubes. You get three tubes for just $5.95 and the possibilities are endless! Looking forward to continuing to come up with new design ideas for them. This is a card I made with none other than the Chantilly paper packet. Have I already told you, a million times, that it's one of my favorites? I kept this card simple, only stamping two images, the cupcake and the sentiment in Black ink. I used our Cotton Candy Exclusive Inks Marker Set to color in the cupcake image and then added in some of our Pink Glitz Glitter Gel to pretty up the sprinkles on the cupcake. The cupcake image was cut out of the Artiste Cricut Cartridge and the scallop image, out of the Art Philosophy Cartridge. The cupcake image is in one of the stamp sets included with the Artiste Collection. If you are interested in purchasing this Collection or any other products, please visit my website. Items can be shipped straight to your door! I was asked to make a few cards for someone special and got to work one evening last week. Here is one of the cards I created. Gotta love a simple but sweet card! I used our new Claire paper packet and the Casual Expressions Occasions stamp set. I only used cardstock, background & texture paper and one color of ink pad (Outdoor Denim) to create it. The little heart-like border is part of the zip strip cut from the top of the 12x12 piece of background & texture paper. (If you click on the image below, you will see the strip that I am talking about.) It is nice that you can use it rather than have to throw it away. On the opposite side of the decorated piece, the colors used in the paper packet are listed there for quick reference. Don't you love that?! I had fun creating this card and hope the recipient can put it to good use for someone special. It became pretty easy when I decided to use the Chantilly Complements Dimensional Elements and am thrilled with how it turned out. I punched out a few of the dimensionals, arranged them, and here we are! I tried blinging it up a bit but felt the colors of the elements were enough and I did not want to take away from their "pretty". I was concerned with what adhesive would adhere to the canvas cover and went with Liquid Glass (just $6.96 a bottle and it lasts a a long time). Who could go wrong with the LG? :) It has held up well. I did save the plastic packaging the journal arrived in and will use it as a protective covering as I transport my journal. I realize the dimensional items could get caught on something and I would not want that to happen. 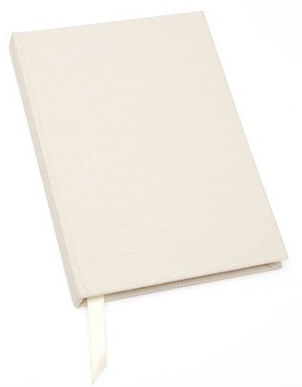 The Journal is just $8.95 and can be decorate as your li'l heart desires. You can even stamp on it! It, with a matching pen, would make a great gift for someone special. If you are interested in purchasing these or any other products, please feel free to shop on my website. You can shop any time of the day/night you want and the items will ship straight to your door. Click here to start shopping and let me know if you have any questions! Several family members and a couple of fellow scrappers gathered at my place this weekend for a mini retreat. It begun Friday night as my mom, sister, cousin and niece helped me kick it off with a slumber party! Everyone brought their own projects to work on and several of us gave a mini class on a technique or pattern idea. It was a great time and definitely something I needed. My adorable niece played with us too and made me get some exercise, wanting to run up and down the stairs as often as possible. I was thrilled to see that she had snuck out of the room for a moment to have my sister snap some C-U-T-E photos of her for me to put on my computer screens. Loved, loved, loved this weekend! I was productive but gotta spread out those posts, right? LOL Watch for them over the next few days! Have a blessed and enjoyable week! One day I sat down and created a few fun treats and this was one of them! Using our NEW My Creations Clear Pillow Boxes (3 for just $2.95 - Z1840) and one of my favorite stamp sets, "Pun Fun", I made this party favor. I also incorporated the "Perfect Fit Frames - 2" stamp set which coordinates perfect with our Artiste Cartridge. We have two Perfect Fit Frames stamp set and they also rank high on my favorite stamp set list. Stuffed with paper rafia and spring Sixlets ($1 a package at the General Dollar Store), you cannot beat the price of this fun goodie! I decorated it up with a few brads and colored our "Color-Ready Seam Binding Ribbon" with our markers! This is our Cotton Candy Marker and I just brushed it onto the ribbon in one simple stroke. Too awesome! I love being able to make the ribbon any color I desire and I only need to have one spool of ribbon! How cool is that? I love, love, love my maternal grandparents! 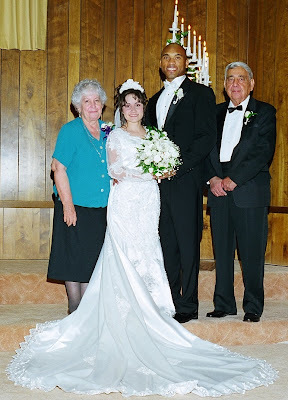 I am blessed to have spent my entire lifetime around these awesome people and have some fond memories of our times together. I shared the most awesome time with my grandmother this past weekend. She had a minor stroke over a month ago and my hubby and I stopped by to see her on Saturday and Sunday. I love my grandma dearly and am thankful for every minute I am given an opportunity to spend time with her. Spring is my favorite time of the year - for many reasons! I especially love the spring weather and all the CUTE things that come with Easter and celebrating our Savior's resurrection. In receiving my March 2013 Consultant News from Pampered Chef, it contained some very adorable and simple recipes which are perfect for this time of the year. 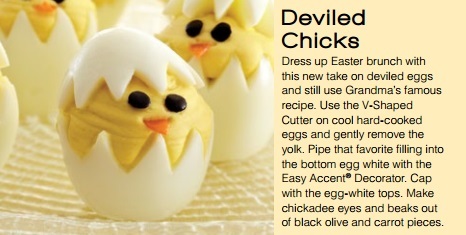 The first I want to highlight are these CUTE deviled Chicks! Read the passage to the right of the photo for directions on how you can make these cute snacks! I submit Pampered Chef orders regularly so if you are ever interested in ordering any of the products, just contact me and let me know! I would love the business and would be thrilled to serve you! 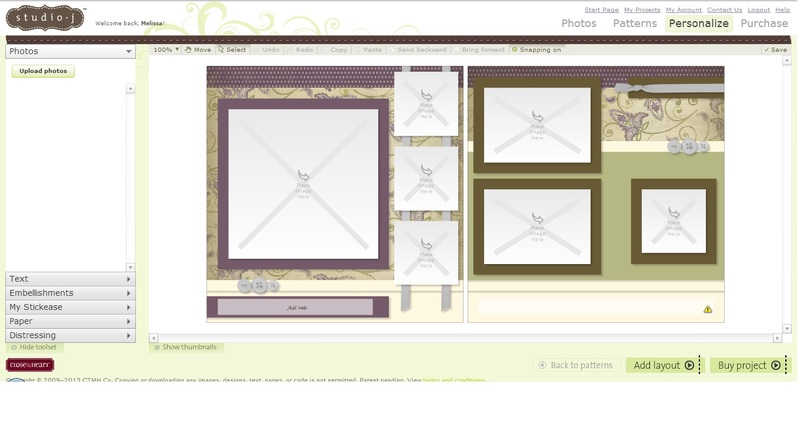 Would you believe this layout was created online using our Studio J online scrapbooking program?! IT WAS! And...look at the next image to see how it looked initially. I started out with the Sonoma paper packet and it truly did look like this. But...with a little Studio J magic - and lots of potential - I was able to make the background & texture paper ANY color I wanted. So the layout ended up being somewhat monochromatic, with some hue changes, and I love it! With Studio J you are also able to keep your photos in full color or change them to black & white or sepia. I chose black and white. Studio J layouts are just $5 through March 15, 2013 - a savings of $1.95 per layout. If you are interested in finding out more about Studio J, please contact me. I can share more over the phone, via email or even conduct a Skype training with you! Once you try it...you'll love it! The March 4th posted, as referenced in my March Newsletter (see below), is posted on March 5th. I was experiencing some technical difficulties. More Time to SAVE on Studio J! If you intended to check out or work with Studio J last month and the time just got away from you, you will be happy to know the special has been extended through March 15! This layout was actually created using the Sonoma paper packet! Can you believe it? 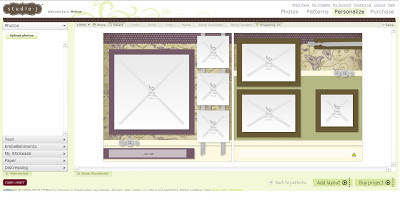 When designing this layout, I desired to go with more of a monochromatic look and this is what I came up with - I love it! There are so many options with Studio J! Check out my blog post for March 4th (link is above) for more details about how I created this layout and more about Studio J. 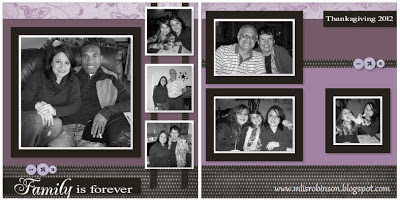 Our online program is great for anyone, even if you are not a scrapbooker, because layouts would make great gifts! 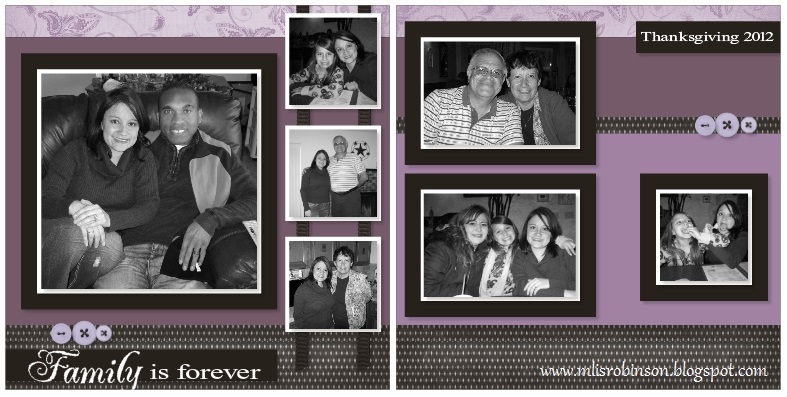 I am even happy to design the layouts for you if you just want to provide the photos and purchase the 12x12 layouts. Contact me with any questions and enjoy reading the rest of this month's newsletter. If I can help you in any way, let me know! Happy March! Jump for Joy in March! During the month of March, hostesses “jump” to the next level of Hostess Rewards when a Gathering reaches $250 or more! * More discounts and free product for hostesses. Now that’s a reason to jump for joy! *Shipping/handling and tax applies. Only Gatherings with a total of $250 or more will qualify for the jump in Hostess Rewards or Hostess Rewards Plus! Qualifying hostesses will receive Hostess Rewards from one level only—the level that is one higher than their sales total. Offer valid March 1–31, 2013. Extra! Extra! Studio J® Savings Extended! All Layouts are $5 through March 15! In order to allow even more time for you to create and purchase Studio J®layouts at the wonderful $5 per layout price, this offer has been extended. Now through March 15, 2013, all Studio J layouts will be $5! * That’s $1.95 savings per each two-page layout! It’s the perfect time to get clicking with ready-made Express Collections or customize layouts with embellishments, My Stickease® accents, and unique papers and color combinations of your own. If you’ve never tried Studio J before, what are you waiting for? You’ve taken the photos. Now keep the memories! *Shipping/handling applies. Studio J credits must be redeemed before this promotion can be applied. Offer valid February 1–March 15, 2013. 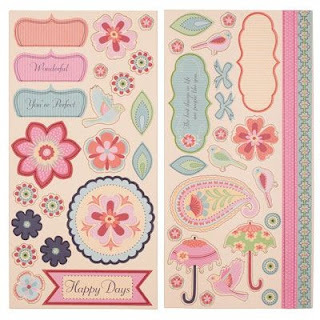 ...the My Acrylix® Floral Happiness stamp set! Whatever happiness is to you, you’ll be able to share it using this stamp set with many sentiments to express what makes you happy. This set of 16 stamps also contains base and shade floral images to guarantee that your projects will really blossom in two-tone trend. Let your art flourish with each layer of added color. This happy set is $5 with your qualifying $50 order this month only. More My Acrylix® Perfect Fit—Frames! If you loved the My Acrylix® Perfect Fit—Frames stamp set, you’ll flip for the Perfect Fit—Frames 2! Like its predecessor, this is a set of four stamps that coordinate with other Perfect Fit sets, such as the new My Acrylix® Perfect Fit—Birthday, My Acrylix® Perfect Fit—Mom, and My Acrylix® Perfect Fit—Dad stamp sets. Additionally, these stamps have a corresponding shape on the Cricut® Artiste cartridge so that you can stamp right on your Cricut®-cut pieces! 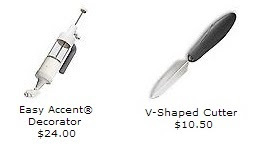 Because it works well with so many other products, this set is a perfect choice at $17.95.